Historical posters There are 61 products. 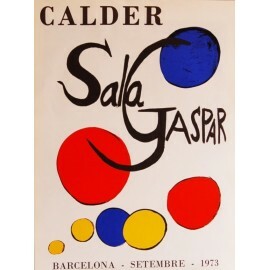 Historical original poster Artist: Alexander Calder Title: "Sala Gaspar, Barcelona" Year: September 1973 Size: 74 x 56,5 cm. Printing method: offset Attention! The colour that you see at you screen may vary from the original poster. Tiny foxing spots may be present. 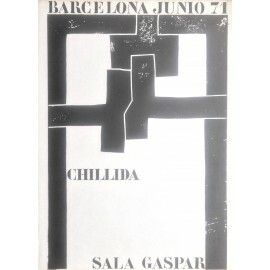 Historical original poster Artist: Eduardo Chillida Title: “Sala Gaspar, Barcelona" Year: June 1971 Size: 76 x 55,5 cm Printing method: offset Attention! The colour that you see at you screen may vary from the original poster. Tiny foxing spots may be present. CLAVÉ Antoni. A don Pablo. 1985. 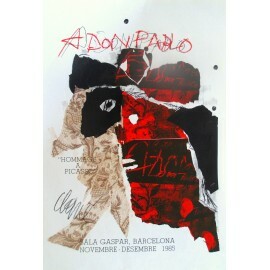 Historical poster Artist: Antoni Clavé Title: “A Don Pablo” Year: 1985 Size: 90 x 62,5 cm. Printing method: offset Attention! The colour that you see at you screen may vary from the original poster. Tiny foxing spots may be present. 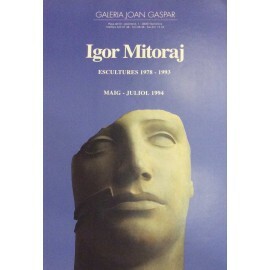 Historical poster Artist: Igor Mitoraj Name: "Escultures 1978-1993” Sizes: 69 x 47,5 cm. Printing method: offset Attention! The colour that you see at you screen may vary from the original poster. Tiny foxing spots may be present. Historical poster. Artist: Joan Miró Title: “Engravings, lithographies and illustrations” Year: 1964 Size: 100 x 70 cm. Printing method: Offset Attention! The colour that you see at you screen may vary from the original poster. Tiny foxing spots may be present. 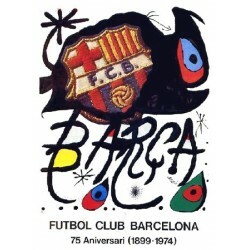 Historical poster Artist: Joan Miró Title: "Futbol club Barcelona 75º aniversari (1899-1974)" Year: 1974 Size: 99x69 cm. 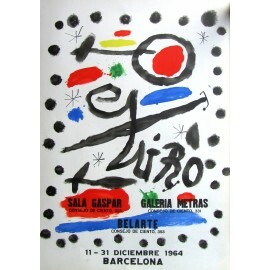 Paper: Guarro Cataloging: Miró Lithographer 931 Attention! The colour that you see at you screen may vary from the original poster. Tiny foxing spots may be present. 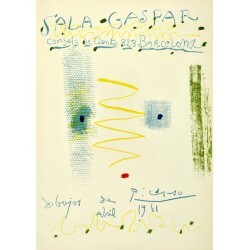 Historical poster Artist: Joan Miró Title: "Futbol club Barcelona 75º aniversari (1899-1974)" Year: 1974 Size: 99x69 cm. Printing method: offset Attention! The colour that you see at you screen may vary from the original poster. Hi pot trobar petites taques degut al pas del temps. 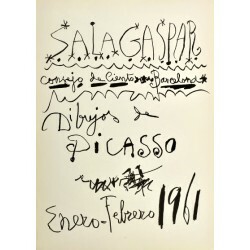 Historical original exhibition poster Artist: Pablo Picasso Title: "Sala Gaspar. Pinturas de Picasso. Noviembre-Diciembre 1960". Year: 1960 Size: 70x50 cm. Printing method: offset Edition: Limited edition Attention! The colour that you see at you screen may vary from the original poster. Tiny foxing spots may be present. 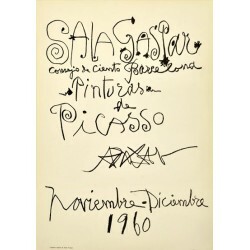 Historical original exhibition poster Artist: Pablo Picasso Title: "Sala Gaspar. Dibujos de Picasso. Enero-Febrero 1961" Year: 1961 Size: 70 x 50 cm. Printing method: offset Edition: Limited edition (500) Cataloging: Bloch 1292 Attention! The colour that you see at you screen may vary from the original poster. Tiny foxing spots may be present. TÀPIES Antoni. 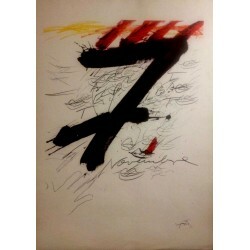 Poster "7 de novembre"
Historical poster Artist: Antoni Tàpies Title: "7 de novembre" Year: 1971 Size: 72 x 52 cm. Printing method: offset Attention! The colour that you see at you screen may vary from the original poster. Tiny foxing spots may be present. CLAVÉ Antoni. 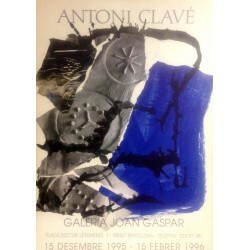 Poster "Galeria Joan Gaspar"
Historical poster Artist: Antoni Clavé Title: "Galeria Joan Gaspar" Year: 1995 Size: 64 x 46 cm. Printing method: offset Attention! The colour that you see at you screen may vary from the original poster. Tiny foxing spots may be present.